Welding Cast Iron can make a preacher cuss. "Aluminum Bronze covers a multitude of sins! " 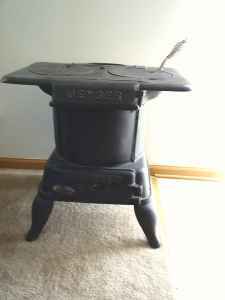 "welding cast iron on A/C? are you crazy? " I have a secret for welding cast iron…. But you have to keep reading to find out. Cast iron is hard to weld. Golf is hard too. But welding cast iron is kind of like playing golf. Every now and then you have a good day and you are lulled into thinking it's not so bad. That is because welding cast iron is like flipping a coin. One job goes pretty good…the next job makes you cuss. Why is that? 2 main reasons… Reason #1 There are many different grades of cast iron, some more weldable than others. And it is difficult to tell them apart. By looking at the sparks it makes when grinding, and also by looking at a fractured surface some old timers can tell the difference in cast iron. But that guy is rare. In fact, when is that last time you talked to an old timer welder about welding?...... Oh snap! I just realized something…….I am an old timer myself now. Son of a gun! What an epiphany? With well over 35 years of welding under my belt, what else would you call me? I don’t feel that old some days…at least I still take the stairs 2 at a time. Reason #2 The environment the cast iron has been in makes more difference than anything else. Exhaust manifolds are by far the hardest cast iron welding job to tackle because they are just flat impregnated with carbon from years of heating and cooling and being exposed to burning fuel exhaust. Welding a broken cast iron leg off of grandmas old pot belly stove is easy. It has not been exposed to hot gases for 20 years. (Except for Uncle Percy's long boring stories.) It broke because Uncle Percy, tripped over his spit cup and knocked it over. Once you weld the cast iron leg back on , if Uncle Percy trips again, it will break again. If not, it will be good to go for years to come. On the other hand, The exhaust manifold from Uncles Percy's boat motor. You know, The outboard that he bought used 30 years ago and he forgot to drain out the water last winter so it cracked.?? ?...That one is not going to be so easy. Enough BS…So what is the best way to weld cast iron? The way you can make work. I have my own little secret for welding cast iron and I will tell you in a minute. Lets look at some real simple metallurgy. Mild steel has less than 0.2 percent carbon. That’s 0.2% or 2 tenths of 1 percent. That’s not much. Medium carbon steel has more than 0.2% and will harden a little if heated red hot and quenched. Cast iron has anywhere from 3 to 8 full percent of carbon. That’s way more than 10 times what tool steel has. And will get as hard as Japanese arithmetic when you weld it if you are not careful. Brittle too! This is why often times when you weld cast iron, you hear it crack somewhere away from the weld. The weld metal shrinks and stresses the brittle cast iron around it enough to crack it. This means groove out the crack, and grind to shiny bright metal all around ½" past where any welding goes on. 3. If the part is small enough , an old gas grill bought on craigslist strictly just for preheating cast iron would work great. that way your wifes London broil wont taste funny. 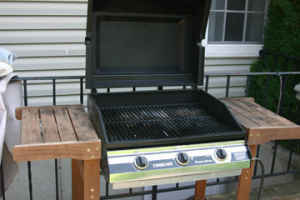 This gas grill was advertised in craigslist for FREE...just needs burners. It would make a great preheat and post heat oven. There are 2 thoughts here….either preheat the piss out of the whole part and keep it hot while welding and cool very slowly, or….. 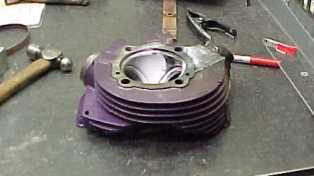 If the part is too big to preheat, still clean and groove out crack, but keep heat input to a minimum. But Most parts I see can be preheated. And when you can preheat, do it. Then whats the best way to weld it? Here is my little secret: Are you ready??? Its strong, it flows really well on A/C, dilution is low, and shrinkage stress is low so it does not tend to crack other areas next to the weld. This method works great for tractor and farm equipment and machinery, But may not work as well when you have a lot of thermal cycles like on an engine. Sometimes the flux on the stick electrode can help dissolve some of the excess carbon. Another possibility that I have experimented with is to Mig weld cast iron. If you are going to try this, you need a ball peen hammer in one hand and the mig gun in the other. 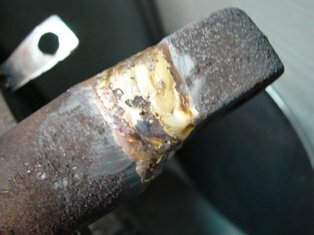 As soon as you finish a short bead and while the bead is still red hot, peen the weld bead with the ball end of the hammer. This helps combat the shrinkage of the weld metal. I have also experimented with some success, using a small mig welder and feeding extra nickel rod in like I was tig welding to keep the weld from hardening..HAH… I bet you never thought of doing that. Bottom line is still the same, one cast iron welding job goes good , the next one makes you question the meaning of life. most assuredly , they will have to order it, its not asked for that often.